Includes leather- wrapped steering wheel with satin-aluminum spokes and bright shift knob. Includes Dark Charcoal interior environment with Dark Charcoal carpet, Red sport bucket leather front and rear seating surfaces with Red front door trim inserts and Red floor mats. Includes 18" x 8.0" polished aluminum wheels and P235/50ZR18 all-season tires. 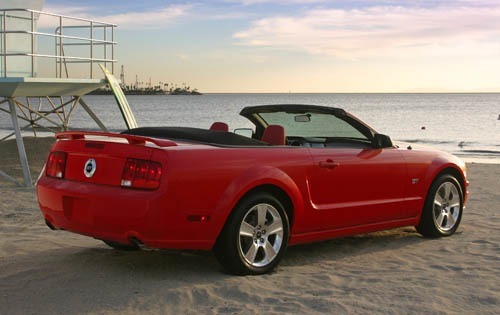 Eliminates spoiler assembly from rear decklid. Includes driver's and passenger seat side-mounted airbags, featuring side-impact head protection and rollover protection. Includes 17-inch bright machined aluminum wheels. Includes leather-wrapped steering wheel with satin aluminum spokes, bright polished register rings and bright shift knob, satin aluminum-plated door handles, special new bright polished six-gauge cluster with MyColor feature and message center, satin aluminum door sill scuff plate with bright MUSTANG lettering insert and Dark Charcoal Aberdeen pattern front door panel inserts. 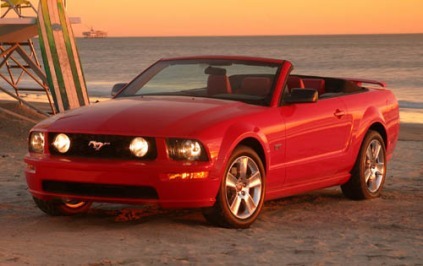 Includes leather-wrapped steering wheel with satin aluminum spokes, satin aluminum-plated shift lever, satin aluminum-plated door handles, special new bright polished six-gauge cluster with MyColor feature and message center, satin aluminum door sill scuff plate with bright MUSTANG lettering insert and Dark Charcoal Aberdeen pattern front door panel inserts. Includes intrusion and incline sensor module, alarm sounder separate from horn, unique anti-theft locksets and 60-AH battery. Includes four (4) locking wheel lug nuts and key. 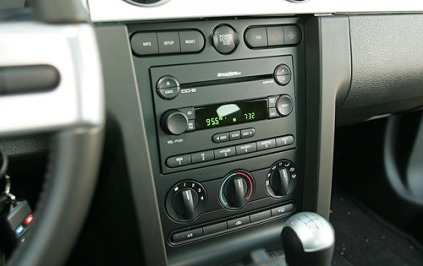 Includes AM/FM stereo with in-dash, 6-disc CD changer, MP3 player and 10 Audiophile speakers. Includes 18" x 8.0" polished aluminum wheels and P235/50ZR18 all-season tires. (Late availability). Includes leather- wrapped steering wheel with satin-aluminum spokes and satin-aluminum finish T-handle shift lever.